But let's not call the whole thing off. I said this week was going to be dedicated to simple summer essentials, and was keen from the outset to include my favourite summer salad: tomato and mozzarella. But first, some background (or waffle - you decide and feel free to skip this paragraph). Growing up, salad for us, like many working class families, included the ubiquitous iceberg lettuce, watery tomatoes (although cherry were always my favourite) and cucumber. A summer staple, served with leftover roast meat or ham for packed lunches. The amazing thing about being a market shopper is the fact that you had to buy seasonal produce. Now it seems odd that those of us on lower incomes were embracing through necessity something which is now seen as a desirable indicator of one's ethical status and an appropriate choice to make. But enough preaching, you get the picture; salad = boring. And I have to admit it took me a long time to move away from the familiarity of that prescriptive recipe as it were. I remember a flatmate at uni adding dressing and mango to a chicken salad and thinking it wonderfully decadent. Adding croutons and thousand island dressing (yes, I know, kill me now) was my next step, and then - once again spurred on by Mr Oliver - I started to experiment. Watery tomatoes were replaced with home grown (actually that is a lie I distinctly remember my grandma growing tomatoes in her greenhouse and indulgently letting us eat them straight from the plants). Peppers were added and dressings experimented with. Over time I discovered first rocket, and then watercress preferring to grow my own in window boxes and plant pots than use the bagged, extortionate supermarket versions. Today salad is once again a summer staple, it's largely diet friendly and means I get an extra serving of my five a day. The produce Asda sent me was calling out to be made into a salad and my tummy was calling out for that to be my favourite. I'm including two ways of making this, not because I'm showing off, but because if you're left with some overripe tomatoes then slow roasting them first works best. 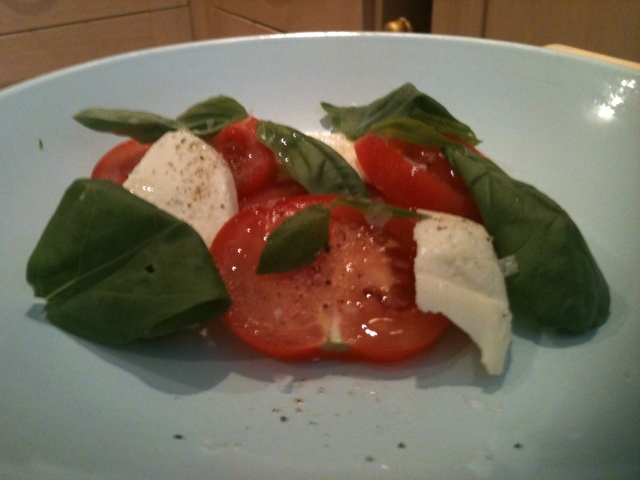 If you're eating mozzarella raw, such as in this salad - buy the best you can afford. The taste does make a difference. Please don't remortgage your house though, stay within reason. 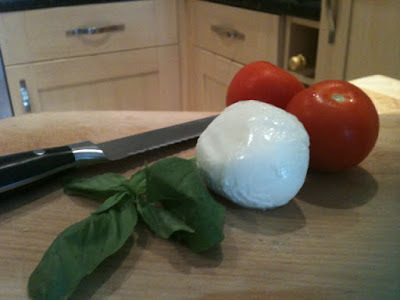 If you're cooking with mozzarella buy economy/ basics branded. In blind taste tests when the cheese has been cooked people categorically can't tell the difference. If you store your tomatoes in the fridge, get them out at least an hour before making this as it means you can taste the flavour of the fruit as opposed to just the cold. Fresh basil or if you've had a glut of herbs you needed to preserve, a drizzle of basil oil. 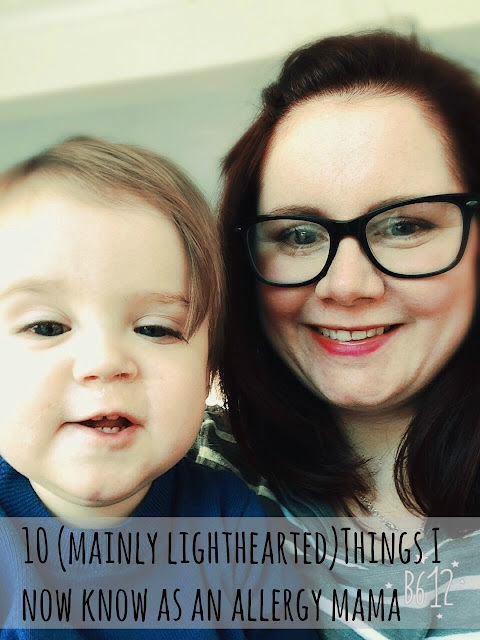 See tomorrow's post for details. (I can't believe I just typed that, slice them how you want!) 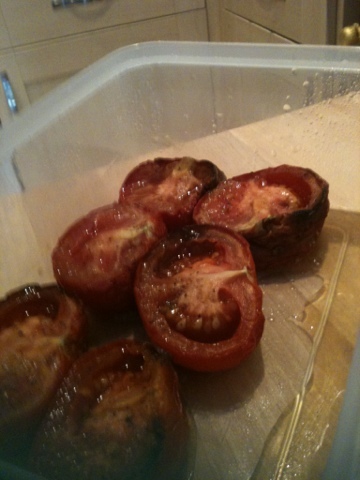 if you've not got a super sharp knife use a serrated one as it makes slicing tomatoes easier. 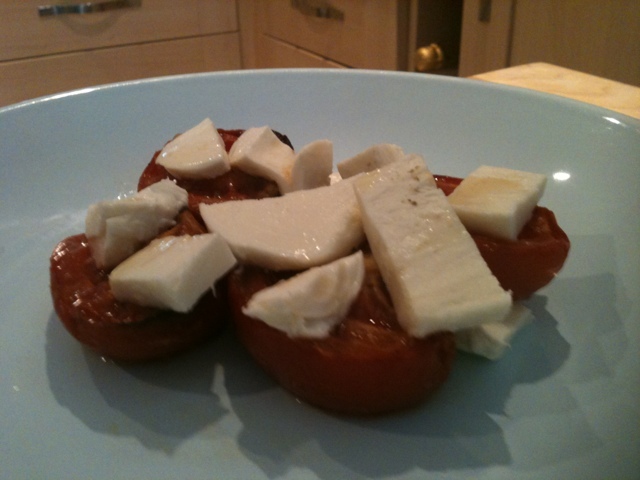 If I'm being fancy I arrange them on a plate, alternating the tomato and cheese. If, on the other hand I'm making lunch for me I whack it all in a bowl and scoff greedily sat in as much sunshine as either the office, training room, front step or balcony can muster! So there you have it, my salad history and mozzarella and tomato salad two ways. What more could you want?